The problem with the use of refrigerators may be the formation in them of snow and ice in large quantities. It greatly hinders their quiet operation. Before trying to rectify a similar fault, first it is necessary to understand the cause. The reasons for the freezing of ice in the refrigerator can be different. To determine their need, depending on where frost occurs, as well as some other factors. The elimination of damage is necessary to begin only after can not figure out why there is ice formation. The frost in the refrigerator can start to be formed, for example, for the reason, if the defrost sensor stops working as it should. When the rear wall is covered with a layer of snow or ice, it means that the defrost is either not happening at all or it is malfunctioning. About the proper operation of the defrosting sensor is illustrated by the fact that the walls of single-compressor refrigerator frost is kept for 15 minutes, then thaws in half an hour. Good sensor one compressor of the refrigerator needs to keep the frost 35 minutes and the same amount of time to melt it. One of the most common mistakes when operating the refrigerator – constantly clean it in hot pots. It greatly affects the defrost sensor, and hence the entire refrigerator. If in addition to freezing the back wall of the refrigerator, the appearance of ice discovered on the side, it is a signal that it is time to replace the worn gasket. This can be done in different ways depending on how it is attached to the door. In some models the seal is simply inserted in a special groove. Then you can just drive into the sealing strip groove without additional fastening elements. Another cause of ice in the fridge can be faulty compressor. If the unit is leaking refrigerant, the compressor rests, and because of his constant work inside the refrigerator all the time the temperature rises. 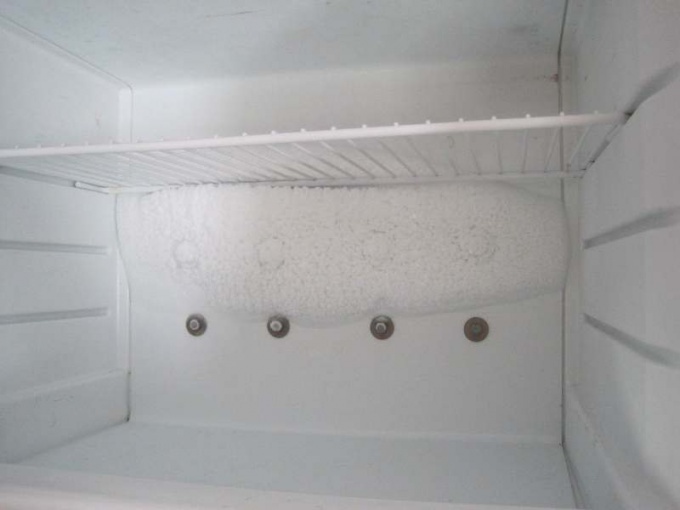 This leads to the formation of the snow cover inside the refrigerator. These are the main causes that result in the freezing of ice in the fridge. If you try to compile them, the following picture emerges. Upon detection of ice in the freezer the first thing we should remember how often you put him in a hot products. If not, the problem lies in devices inside the refrigerator – it could be the compressor, gasket, sensor defrost. For Troubleshooting it is better to invite a specialist.